Chunky, unusual and extremely eye-catching are a few words that describe our Rocks and Stone rugs, this stunning range really is ground breaking! 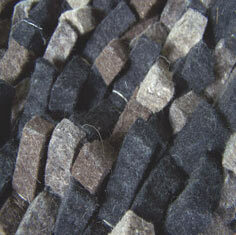 The use of high quality felted New-Zealand wool adds to the overall effect of each rug, the quality is easy to see. Rocks have a shaggy appearance which is quiet unique in construction and Stones are flat-woven in individual blocks of felted wool. Available in large size and bespoke sizes to order. This category also features Crush rugs by Linie Design, these are very similar to our popular Rocks collection. Handmade in India from 100% wool, the pile weight is 3.5KG and the rugs overall weight is 3.9KG.